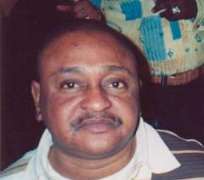 For the president of Association of Nigerian Theatre Practitioners (ANTP), Prince Jide Kosoko, Sunday, January 25, will remain indelible in his memory. It was a day he realised that the maxim, which holds that a prophet is without honour in his home, is always correct. It was a day stakeholders in the world of make-believe and his numerous fans which cuts across all the segments of Nigeria's movie industry, Nollywood, trooped to Ojez Restaurant at the National Stadium to tell him that they appreciate his contribution to the industry; that they love him and will always be there for him, come rain, come shine. The event was the newly-introduced monthly Ojez Entertainment Centre Forum reception for those who have excelled in their chosen careers, be it in entertainment, politics or economy. And Kosoko, who is fondly referred to as 'The Prince of Lagos' by his colleagues on account of the blue blood that runs in his veins, on that day became the third entertainer to be honoured - after Chief (Mrs.) Christy Essien-Igbokwe, the first person to be honoured in the Forum, and Nkem Owoh (Osuofia) - looked resplendent in his attire at the reception. Flanked the likes of Pa. Kasumu, Madam Kofo, Deji Balogun of Lagos Television (LTV), scores of friends and family members, it was obvious that he was having his day in the sun as he grinned from ear to ear with them. Anchored by Segun Arinze, the evening saw the likes of Kanayo O. Kanayo (KOK) mounting the stage to eulogise the accomplished thespian. KOK told the audience, which included entertainment writers, that Kosoko was not only a Nigerian actor, but an African movie superstar who has paid his due in the industry. KOK said he was the least surprised that the management of Ojez Entertainment Centre decided to publicly honour Kosoko. "For according one of us this great honour, I will like to thank Ojez led by Joseph Odubeatu. My brother, Jide, deserves this honour; he has done well for the industry and he deserves all the honour he can get," KOK said. Evergreen Band jazzed up the evening with its beautiful rendition of highlife tunes of yesteryears while 'Fine Boy' sent the audience laughing their hearts out with his hilarious performance.